NEW ORLEANS – The postseason in NAIA Indoor Track & Field is upon us. With Conference Championship Weekend starting up and the NAIA Championships nearly two weeks away, teams are starting to peak. 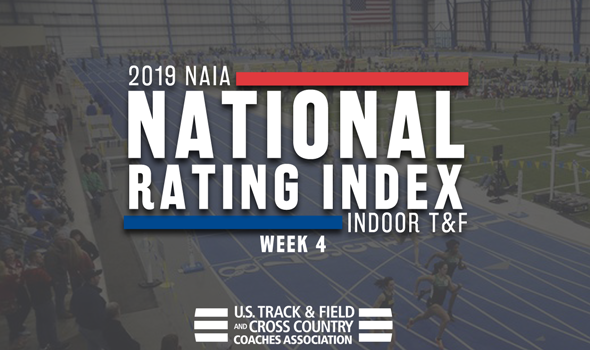 That means we might have saw some movement in the most recent National Rating Index that was released Wednesday by the U.S. Track & Field and Cross Country Coaches Association (USTFCCCA). Remember: The 2019 NAIA Indoor Track & Field Championships will be held from February 28 to March 2 at the Jackrabbit Athletic Complex in Brookings, South Dakota. Indiana Tech continues to headline the Men’s National Rating Index. The Warriors received a pair of strong efforts this past weekend from their relay teams as the DMR quartet moved up to second nationally with a time of 10:13.97, while the 4×400 team is now ranked fourth nationally at 3:19.42. Wayland Baptist (Texas) made some noise this past weekend. The Pioneers notched a few strong marks, including a nation-leading 400 from Quintaveon Poole (47.03) as well as the No. 3 mark in the nation from the 4×800 team at 7:53.66. Donte Irving also chipped in a great performance in the triple jump as he moved up to fourth nationally at 15.00m (49-2½). Concordia (Neb.) owns the nation’s top-ranked 4×800 team at 7:51.74 and that has it ranked third in Week 4. The Bulldogs are also hoping for big marks in less than one month from Josiah Mcallister (No. 1 in the 1000) and Cody Williams (No. 3 in the heptathlon). Keiser (Fla.) is ranked fourth this week. Rajay Hamilton and Jerimy Strainge gave the Seahwaks a potent 1-2 punch in the 200 as the former clocked the second fastest time in the nation this past weekend, while the latter is now ranked fourth. Cornerstone (Mich.) rounds out the top-5 this week and can thank Colin De Young as well as its top-ranked DMR team for that. Young is No. 1 in the 5000 at 14:22.86, while the DMR team got the baton around in 10:13.18 two weeks ago for the national lead. Indiana Tech cemented its spot atop the Women’s National Rating Index this past weekend with several great efforts. The Warriors now have a national-leading 4×400 relay team at 3:50.38 and the second-ranked woman at 600 meters in Doshawn Franks. Wayland Baptist (Texas) rang up seven top-5 marks nationally this past weekend, including three No. 1s: Devin Johnson in the 200, Tiona Owens in the triple jump and the 4×800 relay. The Pioneers could also get a lot of help from Jackline Cherono and Jackline Jemeli in the 5000 as they’re ranked third and sixth, respectively. Concordia (Neb.) is looking for big points from its throwers, as it has the past several years. Adrianna Shaw, who was already ranked No. 1 nationally in the weight throw, moved up to sixth nationally in the shot put this past weekend. Speaking of strong efforts in the field events, fourth-ranked Doane (Neb.) is in prime position. The Tigers are looking for big things from Alexis Dale (No. 1 in the high jump), Kate Grint (No. 1 in the shot put and No. 4 in the weight throw) as well as Paige Hervert (No. 5 in the pentathlon). Aquinas (Mich.) held steady at No. 5 from Week 3 to Week 4. The Saints are led by Victoria Faber (No. 1 in the pole vault), Alexis Miller (now No. 2 in the 1000) as well as its DMR and 4×400 teams that are both ranked third in the nation.